It’s always nice to see a scorned woman fall in love and find happiness once again; especially when her heart was broken in such a nasty way. In May 2008, Shania Twain’s husband of 14 years, Robert “Mutt” Lange up and left the country singer for her best friend, Marie-Anne Thiebaud. Of course Mutt and Marie-Anne denied the affair, but no one really believed them. As a result, Shania Twain, 45, became close with Marie-Anne Thiebaud’s husband, Swiss Nestle executive Frederic Thiebaud, 40; no doubt bonding over heartbreak. 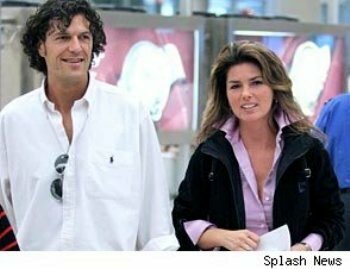 Fast forward to August 2009 when Shania Twain confirmed her budding relationship with Frederic Thiebaud, after they were spotted vacationing together in Canada, Florida, and New York City. According to reports, Thiebaud asked Twain to be his wife about two month ago while in Switzerland, presenting her with a three-carat solitaire diamond ring. Twain stepped out with Thiebaud at Serafina’s Fabulous Grill in NYC on Thursday with an enormous engagement ring. 50 queries in 1.352 seconds.